As described in this blog before, Mt Jasper is a small unassuming summit located in the Northern NH City of Berlin. While the 200 acre parcel it sits on has been owned by the City, it has remained largely undeveloped. In the past few years, AMC has helped coordinate a large stewardship effort, from parking lots to trails to community planning, and the most recent milestone in this effort is a set of signs and maps. 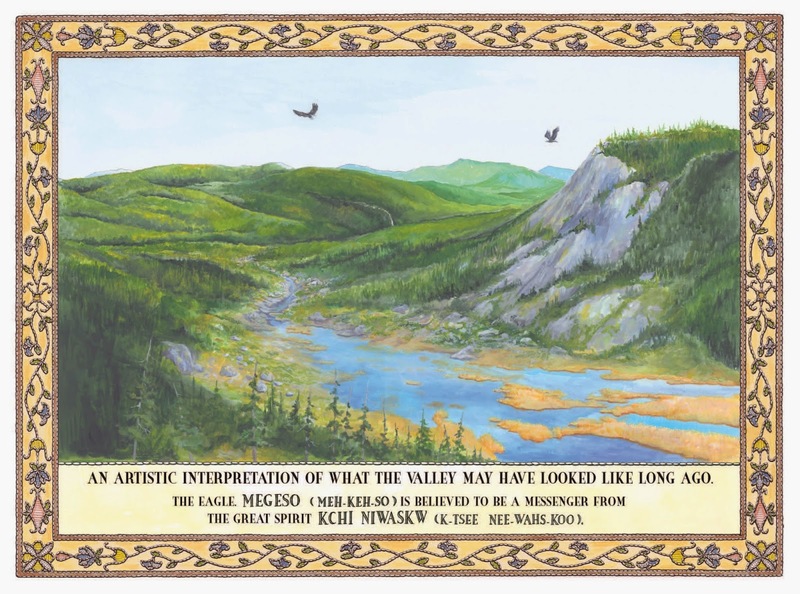 Since Mt Jasper is both a beautiful natural area as well as being of archaeological significance, the interpretive signs describe the natural and cultural history of the area through combining information about hardwood forests and glaciation with Abenaki phrases and beadwork; these signs are located along the trail, ending with a remarkable painting at the summit which depicts the valley without the City in it. Artist Mike Eastman (L) and business partner Andre Belanger (R). 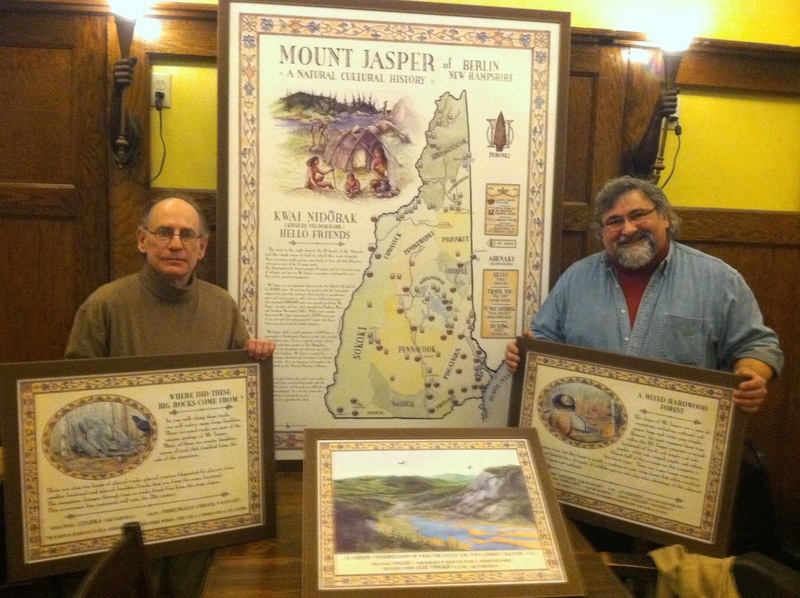 At the base of the trail is a beautiful map that is focused on the history and significance of the summit for the Abenaki culture. (Abenaki? Step back in time to a New Hampshire that is un-colonized, and you will find the Abenaki). What is absolutely remarkable about these signs is that they are all drawn.....by hand. The lettering, the borders, and each painting were done painstakingly by local artist (and Abenaki himself) Mike Eastman. Once the images and signs were completed, local signmaker and artist Andre Belanger transformed them into the digital versions that were then turned into the signs themselves. Sign installed at the summit of Mt Jasper, after the ELC students cleared the view. This summer, the Enriched Learning Center (ELC) in Berlin, a strong and constant partner in this project, installed all four signs along the trail, as well as clearing a small view for the sign at the summit. The ELC is an alternative learning program for behavioral and at-risk youth. Students perform community service around the City, including working on trails, community gardens, and even in people's homes. For this project, special props go out to Keith (the expert hole-digger) and John (who carried signs and posts up and down the mountain more than once). Last but not least, AMC cartographer Larry Garland created a wonderful community trail map, that shows the trails maintained on the summit. 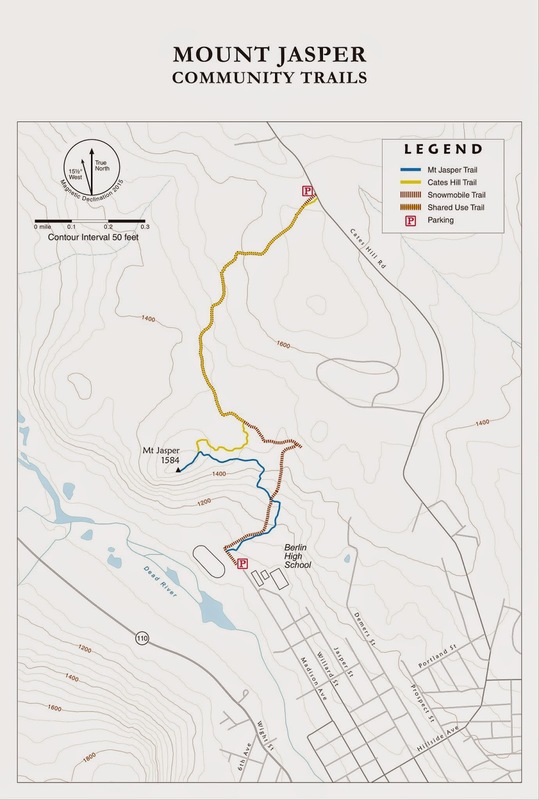 The blue trail was constructed by the Jobs for America's Graduates (JAG) program in 2011, and the yellow trail was constructed by the ELC and the AMC Trail Crew in 2013. The yellow trail project was done in partnership with the White Mtn Ridgerunner snowmobile club, who improved their snowmobile trail to make it welcoming to hikers and walkers. Since undertaking this project in 2009, the wealth of community support for these simple developments of trails and signs has been incredible. After five years of development, the focus now is on maintenance and support of long-term stewardship of the summit and the infrastructure.